SolidWorks 2009 Beta is fast approaching. Word on the street is the software is slated to be made available Monday June 9, 2008 around lunch time EST. As Mike Puckett reported earlier today the Beta Homepage is being readied for launch. Here are a couple of things you need to know about this year’s Beta program. You will need a Customer Portal account tied to licenses of SolidWorks to participate. Beta access will be restricted to subscription customers only. If you meet the two previously mentioned requirements, you should be able to access the Beta Homepage HERE. (You may have to click the link twice as the first click will log you into the Customer Portal.) The Beta Program is scheduled to last 8 weeks. The Beta Forums are already up and running and the discussion has begun. Prizes for this year’s contest have also been posted. If you want an early look at the What’s New document, the link has now been posted to the Beta site. (From the Beta Homepage select “Beta References” then look at item 11 in the “Getting Started” section.) As soon as the NDA period is lifted I’ll post a direct link. UPDATE – 6/9/08, 5:24 CST: Looks like the planned release date of today hit a snag as the download has not been posted yet. It appears to be coming soon as most of the Beta Pages have now been taken offline for what can be presumed as final updates for the release. I’ll update this post as soon as it is made available. 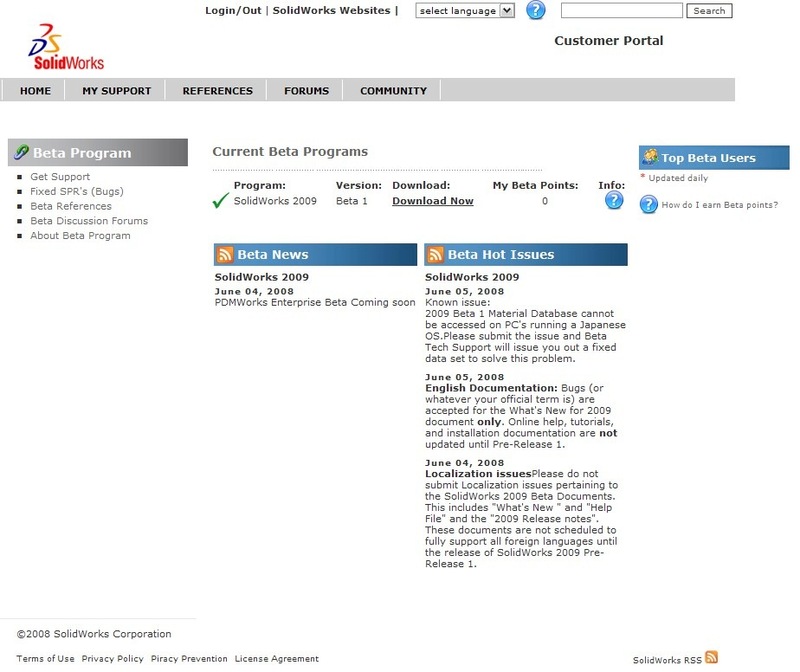 UPDATE – 6/10/08, 1:36 CST: The Beta Home page is back up and SolidWorks 2009 Beta 1 has been posted. Let the downloads begin. Happy Beta testing!